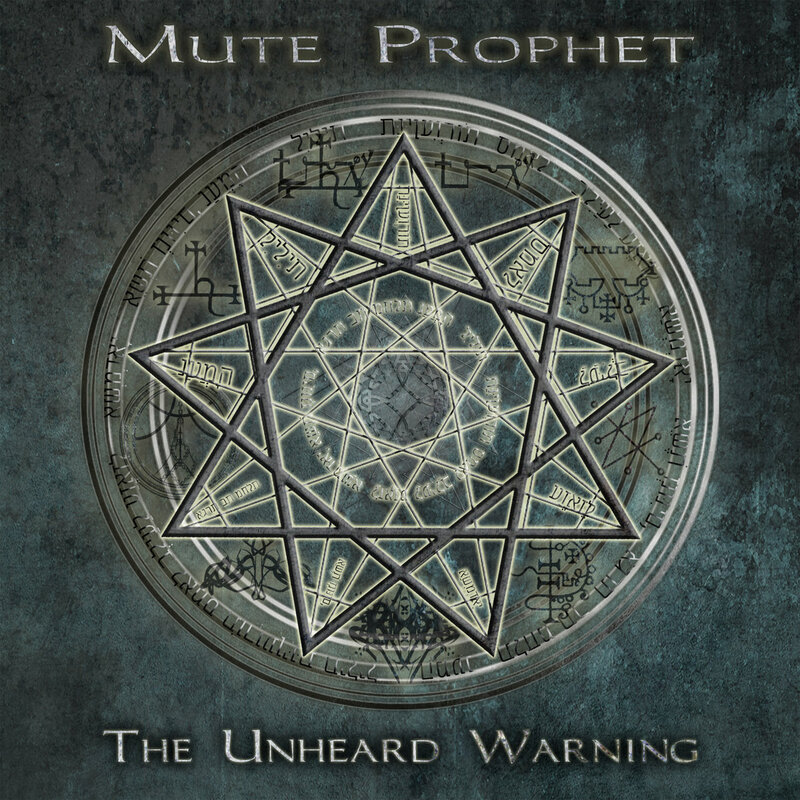 In December last year, symphonic prog metallers from St. Louis, Mute Prophet released their debut album titled ‘The Unheard Warning.’ Three months later, they put out a remixed version of the album, something that not so many bands actually do in such a short span of time. We talked with the band about their decision behind this move, the record itself, and more. Define the mission of Mute Prophet. Kevin Goetz: I think the mission of Mute Prophet is, at its core, just to create the kind of music that we love as listeners, and that we enjoy as performers. Chris Tompkins: And if other people enjoy it along the way, that’s even better. Adrienne Odenthal: It was basically to make something we were happy with, and hopefully other people will like it too. Tell me about the creative process that informed your debut studio album The Unheard Warning and the themes it captures. Kevin Goetz: The creative process was basically us living in our basement studio for a straight year, spending literally every day working on this. We even set up air mattresses and slept down there, so we would wake up and immediately be motivated to get to work. As for themes, it’s actually a concept album, though I like to keep people guessing on what the story actually is, so they can try to relate to it themselves and with what they’re going through. On the surface, though, it’s about surviving various forms of adversity and coming out empowered on the other side. What is the message you are trying to give with The Unheard Warning? Kevin Goetz: It sounds cheesy as hell when I summarize it like this, but… No matter what you’re struggling with, there’s always a way to overcome it. The album explores a question of whether victimhood can be blamed on someone else, or if we should focus on ourselves and our choices. There’s also some really cool occult symbolism that I hope people will dig into as well. Adrienne Odenthal: Basically what Kevin said, the idea that there’s nothing that can’t be overcome. Kevin Goetz: The drums and orchestrations were written in Guitar Pro, exported as MIDI and then programmed, and then we recorded the guitars over that base. The album was originally released in December last year, but last month you re-released it, with new remixes. What initiated the decision to remix it? Kevin Goetz: Mainly it was because I realized I hated the original production. It’s not easy to mix an album where drums, vocals, massive orchestras and complex guitar riffs are all equally clear and audible. I took some bad advice on the first mix, and it came out… Not where I wanted it to be. So the remix is much more my original vision for the album. Adrienne Odenthal: At first Kevin put himself under a lot of pressure to conform to kind of a “standard” mix, and the remix was more just what he originally wanted with it. Is the dynamic flow of the pieces on The Unheard Warning carefully architected? Kevin Goetz: Absolutely. There was a lot of time spent on dynamic flow. We have a lot of songs that include clean sections in addition to the aggressive distorted sections, and we took the time to make sure each song’s ending flows into the beginning of the next. I think my best example of that is the transition from “Ardor of the Flood” to the title track, “The Unheard Warning.” We realized it ended way too abruptly and the sudden aggression of the next song felt jarring, so we re-worked the ending to tie its main riff in with some of the riffs from the title track. Chris Tompkins: Yeah, and I really like how the second half of “Theurgy” slows down and flows really nicely into “To Be Gone,” the album’s only real ballad. Adrienne Odenthal: The songs also create tension and resolution as part of the album’s overall story. There’s definitely a conscious pacing that we all got together and agreed on after a lot of experimentation. Kevin Goetz: Well, like I said, we usually have a core of drums and orchestra programmed beforehand. Then I’ll sit down with my guitar and run it direct into my computer and record different ideas until I’m totally happy with the guitar parts. Then we’ll double the guitar parts with bass, then Chris and I will record our solos, then finally Adrienne will add the vocals. Chris Tompkins: You forgot how you constantly go back and redo everything because you suddenly decide it’s not good enough. Adrienne Odenthal: At first we had to do a lot of trial and error figuring out how to get good vocal recordings out of our home studio, and then I needed a good amount of time to refine my vocal style to suit the band’s newer approach post-2015. I used to sing everything in a very operatic way – it was how I learned – and we wanted something a bit more belty for this album, so I had to learn to add kind of a rock edge without losing the opera. That was one of the most challenging things I’ve ever had to do musically. 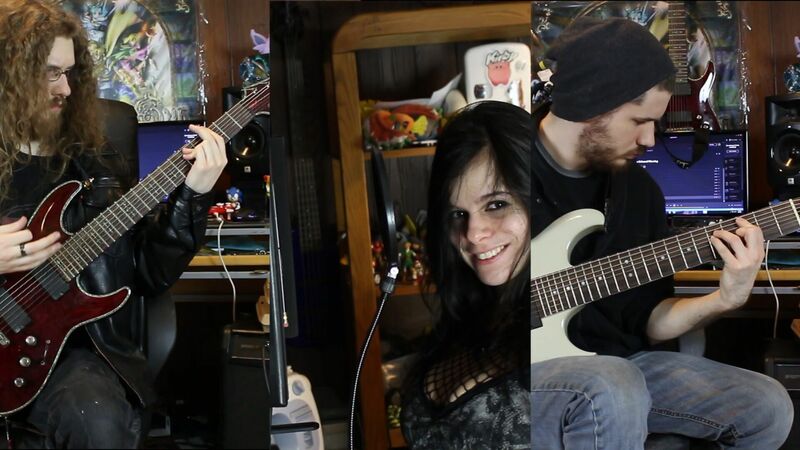 As for the actual recording, there’s a lot of down-time where I’ll record my parts and Kevin will mix for a good chunk of time between takes, sometimes up to two hours, so I’ll work on website design or merch. I realized I could still be productive when I wasn’t able to sing, because there were so many other jobs that needed to happen simultaneously during the album’s creation. How long The Unheard Warning was in the making? Kevin Goetz: Six years, I think. Chris and I had a terrible vocalist who strung us along for the first three of those years, and then Adrienne joined and we spent around 8 months practicing together before recording an attempt at an album, then we didn’t like our style, so we eventually scrapped everything in 2015 and spent all of 2016 working toward where we are now. Chris Tompkins: That other singer… Yeah, that was an ugly and complicated situation. For anyone who’s interested, we’ve been working on a documentary to answer some of our fans’ questions about that and other things, so keep your eye open. Adrienne Odenthal: I would argue that it’s actually taken more like a decade. I’d been friends with Kevin and Chris for years even before I joined, and I witnessed that they had been trying to finish the album for an incredibly long time, and they were really held back by band members who weren’t committed in the same way they were and didn’t have the same goals they did. Kevin Goetz: Nightwish and Epica for the orchestras; Periphery, Children of Bodom and Animals As Leaders for the riffs; Alexi Laiho and Rusty Cooley for my solos. Chris Tompkins: Paul Gilbert and Michael Romeo are probably the big ones for me. Adrienne Odenthal: Simone Simons, Floor Jansen, Charlotte Wessels and Tarja Turunen are probably the big ones for my clean singing; Angela Gossow, Christian Alvestam and Juha Harju for growls. Kevin Goetz: It’s a game-changer! We couldn’t have done this without technology being where it is. We didn’t have much of a budget, and we were able to use free VSTs for the guitars and free soundfonts for the orchestra, and EZDrummer for the drums. It’s amazing that such high-quality sound is possible to produce for free like that. Adrienne Odenthal: I think it’s amazing that people can do things that they were never able to do before. 20 years ago, an album like this would have been literally impossible to make. I know there are still people who think that technology somehow ruins music, but in my experience that’s just their own bias. Ten years ago, bands had to spend hundreds of thousands of dollars to get a decent orchestral recording, but now you can program something for free with a computer and the vast majority of listeners can’t tell the difference. Kevin Goetz: I’d certainly like it to. It does explore some thought-provoking ideas. There’s a lot of emphasis on how our personal focus determines how we feel, and how by shifting our focus, we can learn to overcome the people and circumstances that hold us down. Also, again, there’s some really interesting occult symbolism that enhances this idea. It’s easier and more comfortable to sink into martyrdom and self-hatred, than it is to realize that some people in your life do nothing but harm you, and deserve to be cut out of your life. Chris Tompkins: In one sense, I think that we’re just trying to leave our own unique mark on music. Maybe someone hears our music and applies it to themselves. It’s cool to think that people could be influenced by our music the same way we were influenced by what we grew up listening to. Adrienne Odenthal: And in another sense, I feel like our music helped me through some really severe depression. It gave me something to focus on creatively and use that to cope and to grow, and it was something to turn to where otherwise I might have fallen into some self-harm habits. It gave me incentive to figure out my problems constructively instead of sitting there feeling sorry for myself. Kevin Goetz: Well, we’re already recording a second album, which people will definitely love if they enjoyed The Unheard Warning even a little bit. We’ve also been putting together some covers of similar bands, to get our music in front of a larger audience. And we’ve been promising a documentary on the creation of this album for a couple years now, and people on Youtube and Facebook are apparently still excited for it, so at some point we’ll do that as well. Chris Tompkins: I think we’re always going to be trying to make new music. This is something we basically grew up doing, so it’s not something we can ever really stop. There will always be new plans for the future. Adrienne Odenthal: We’ve got a whole host of things planned. It’s a lot of preparation right now, but we’re all really looking forward to everything. The Unheard Warning is available from Bandcamp. Follow Mute Prophet on Facebook and Twitter.